Based on a report by Total Rugby. Given the Germany’s higher ranking, long history, greater resources and home ground advantage, their win on Sunday was not unexpected, though their opponents defended hard through against waves of German pressure throughout the game. 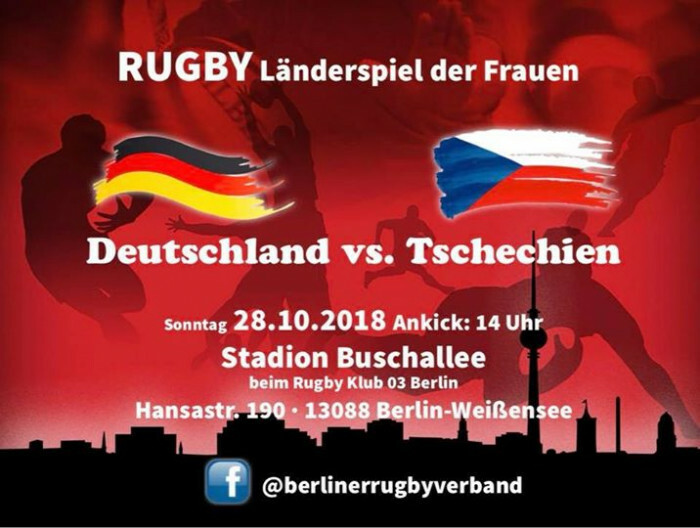 The German XV, lead by Lisa Borhmann were always on top. Wing Katharina Epp got the scoreboard moving after only five minutes with the game’s first trywith outside centre Lea Predikant and Vivian Bahlmannadding to the score before the break. In the second half, two more tries followed from Bohrmann substitute Laura Dervari. Inaccuracy from the kicking tee kept the score down but in the end the 25-0 win left the Dirk Frase and his coaching team satisfied with the outcome. Overall, the forwards were dominant, and only the three-quarter line took a while take control of the game. The status of the game is - as with so many women's XVs internationals at present - unclear. Although the game was promoted as a full international, and although the Czechs at least seem to have awarded caps, World Rugby did not list the game as a "test match".